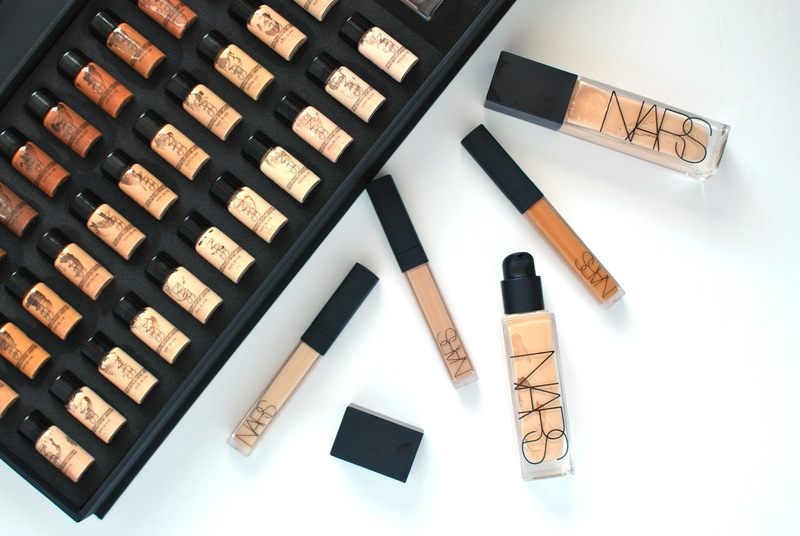 I recently received the new Nars Natural Radiant Longwear Foundation, and I wasn't sure what to expect. So I really took my time to try it out, in order to give you the most accurate review possible. The Natural Radiant Longwear Foundation is sold as a medium-to-full buildable coverage foundation formulated with a skin optimizing complex that improves skin texture, gives you 16-hour of wear with no fading and full-powered radiance, and fuses with your skin tone thanks to specialized pigments. Mind you, this foundation comes in a whooping 33 shades, so finding the right one for you shouldn't be an issue! You may remember that while I absolutely loved (and still do) Nars' stick foundation, its lasting power isn't the best on my combination skin. 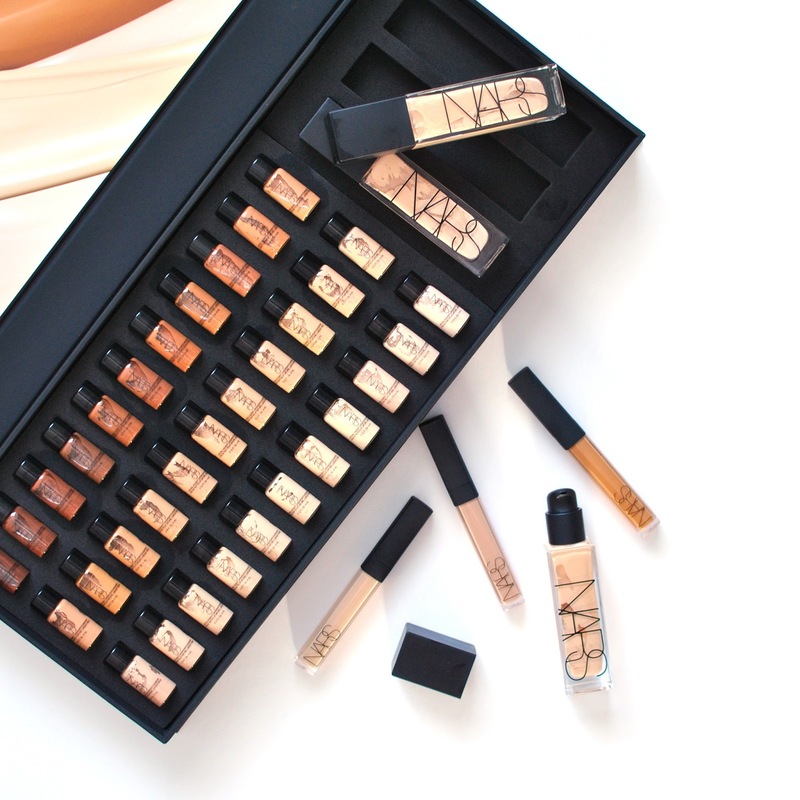 I was that much more curious to put the longwear claims to the test with this one, and see how it set itself apart from other Nars' foundations. I wore the Nars Natural Radiant Longwear Foundation for a couple of weeks. I have long days, that include wrestling with a toddler, walking outside in very-cold weather and adjusting to my overheated office. I even wore it to my son's swimming lessons, where I have to be right by the pool in a very hot, very humid atmosphere (I imagine that's what Florida's like? Florida always strikes me as the ultimate test-place for foundation haha. But I digress). I'd love to list the pros and cons on this foundation, like I usually do, but if I'm being completely honest, I couldn't come up with any cons. Aside from the price, maybe. At $60 CAD ($49 USD), it is pretty steep. Medium-to-full is accurate, but it's definitely more on the "full" side. I didn't really know what a "radiant" foundation was, but after trying this one, I can't think of a better adjective to describe it. The finish is not flat matte, not glowy either. It's luminous, it's fresh, it's radiant. Fantastic!! The formula is so light, it literally feels like you're not wearing anything (and I HATE "feeling" the foundation on my skin, so this is a big one for me). It is also easy to blend, not too runny, not too dry. I do need at least a pump and a half to cover my entire face, which is fairly unusual for me (I usually use less in other foundations). Drumroll please... while I haven't tried it for 16 hours (who wears foundation for 16 hours? ), I can honestly say that the lasting power is incredible. It lasts through extreme temperature changes, sweat (I wore it to the gym once, it didn't move). The formula doesn't break down on my combination skin, and while I do get shiny after several hours, it's nowhere near as much as I do with some other foundations. It does settle into my fine lines when I first put it on (pretty sure this is a law of nature), but it doesn't crease throughout the day. I also tried out the infamous Radiant Creamy Concealer ($37 CAD - $30 USD) for the first time, if you can believe it (it was quickly followed by a second, third, fourth times and so on...). I loved it, and while it wasn't as much of a breakthrough as the foundation for me, I do think it's a very, very good concealer. In a few words: it is creamy, easy to blend, provides buildable coverage (again, on the "full", which is all I want in a concealer), and while it may seem a bit thick, I think it's the creaminess of the formula because it doesn't feel heavy on the skin. It does crease a little, but I have yet to find a concealer that doesn't. Both products are now available online and at Sephora, Murale, Shoppers DrugMart, Hudson's Bay and Nordstrom. As always, while these products were sent to me for review purposes, my opinions are unbiased and honest.